We have been following my mother’s account of her life, written a couple of months before she died of cancer on September 11, 1987. 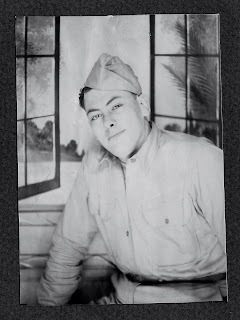 In Part Six of Joan Joyce (Schiavon) Huesca: an Autobiography, she remembers her beloved older brother, Ralph Thomas Schiavon. My mother idolized Tom, who was four years older, and who in her view, could do no wrong. She and Tom grew closer in adulthood, and my mother never stopped looking up to her “big” brother. He, in turn, loved her back with all the tenderness an older brother has for his sister. He and his bride, Angelina “Angie” Ciliberto, asked my mother to be a bridesmaid at their wedding in 1946 and later, to be the godmother to two of their four children. She reciprocated the honor; Uncle Tom and Aunt Angie were my very special – and very treasured – godparents. Tom’s name was one of the last my mother spoke shortly before she died, as she waited for his hurried arrival from his home in Chicago, Illinois, to her bedside in Modesto, California. “Back to school again, but not to St. Dorothy’s this time. Instead I was sent to St. Joachim’s along with my brother Tom. 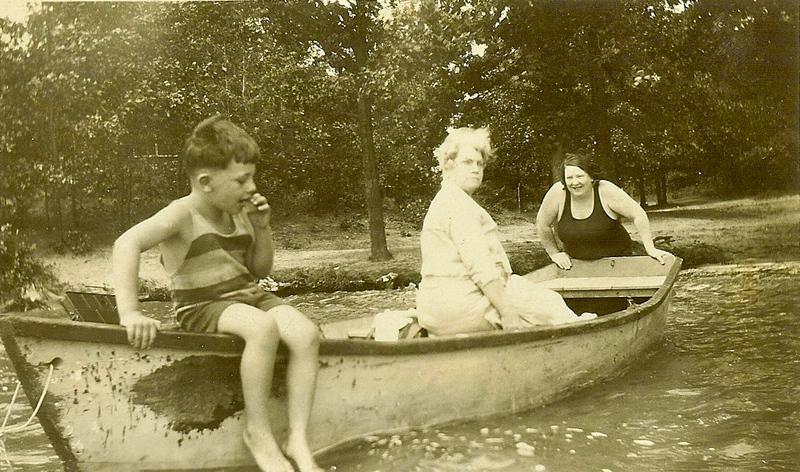 Lazy Days at Big Blue Lake: (left to right) Tom Schiavon, Elizabeth “Lyle” Gaffney, and Alice (McGinnis) Schiavon. Between 1929 – 1932. Hmm…deep in thought. Notice Aunt Lyle’s curious expression. Could she be wondering what her nephew was up to with her in that canoe? “Genius or not, Tom was a problem to the school and the Sisters who taught there. My mother claimed that she spent most of her time traveling from the house to the Principal’s office to see what Tom had gotten into almost daily. One time, she arrived at Tom’s classroom to find the Sister covered from head to toe with grease from an engine Tom had brought to school. Another time, she was called to the Principal’s office to find my brother and a representative of the Street Car Line. Seems Tom had decided to conduct a scientific experiment to see how awake and aware people were early in the morning, and had taken my Mother’s clothesline and interlaced it between the handles on each seat, then sat and watched people on their way out of the street car, falling as they went, and deduced that they really weren’t wide awake after all.